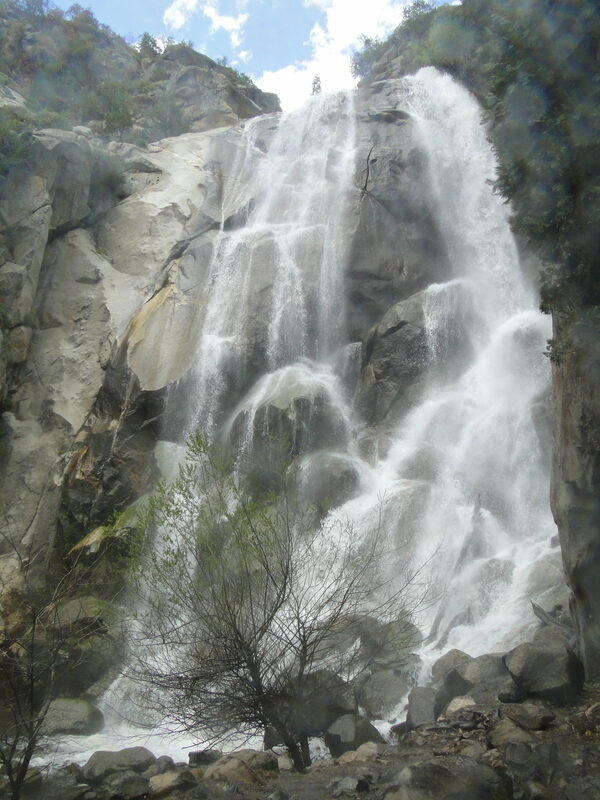 Hiking and camping at Sequoia and Kings National Parks in California was on my itinerary. And what a coincidence that I happened to reach the area on the first day the park was opening for visitors in the Spring. It had been a long Winter and some of the roads were not clear of the snow yet. My thoughts of camping were erased when I arrived at the gates and was informed that camping was not allowed yet, and another big storm was on its way. 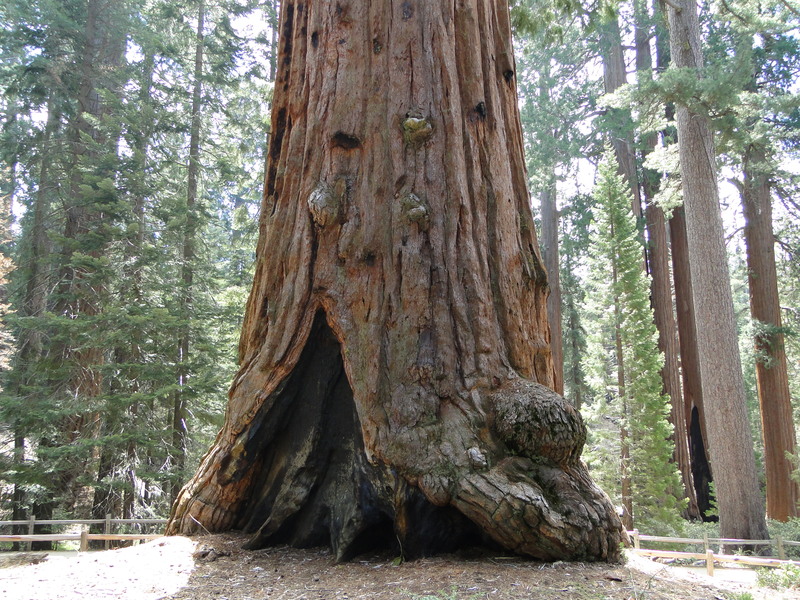 No better way to celebrate Earth Day than hugging a Sequoia! Well, a small one! On April 22, 1970, twenty million Americans took to the streets, parks and auditoriums to demonstrate and rally for a healthy, sustainable environment. Forty-six years later, on April 22, 2016, in my own way I was honoring this special day which was founded by Gaylord Nelson who at that time was a senator for Wisconsin. And no, I did not plan all along to be there on that particular day, but after twenty-six days on the road that’s how far I had made. Nonetheless, it was a remarkable coincidence. I was expecting a long line at the entrance of the park, after all, I assumed that schools would bring busloads of children to celebrate Earth Day. I was wrong! Being the first day that the park was open for the season and with what had been an unstable weather pattern, the crowds weren’t there. 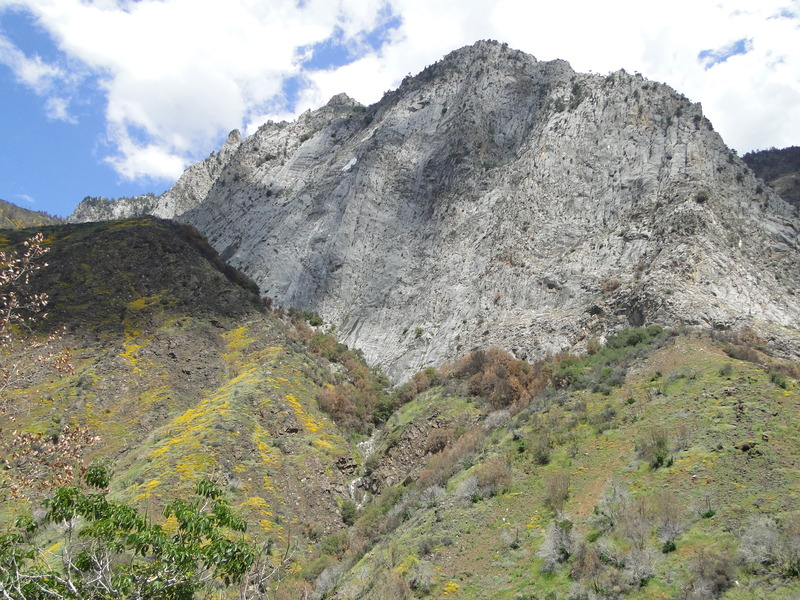 I quickly learned how unstable the weather is in early Spring at the Sierra Nevada and at the Sequoia and Kings Canyon National Parks. Although in the early morning the skies were blue and there was no visible sign of a major storm, all I heard were warnings about a big storm rolling in. The park was relatively quiet not only for being the first day it had open, but because a big storm a couple of days earlier was keeping people away. When I checked about the possibility of camping, the answer was not encouraging. I could find camping outside the park but I was warned that a storm was expected later that evening and the park rangers weren’t sure if the roads would be open the next morning or not. I was also told that if it was a really bad storm they could not tell me for sure how long it would be before clearing the roads and reopening them. The hiking trail conditions were not great either and hiking solo was not recommended either. Except for short hikes closer to the landmarks at the park, venturing out on my own was not a good idea. Safety first! By mid-day it looked unseemly that a storm would roll in. It was a sunny, gorgeous day. What could go wrong? I could not resist the temptation to drive further in the park. The views were stunning and I did see a couple of hikers who seemed determined to find a camping spot. I thought that maybe I would find a camping area and pitch my tent. Earlier that morning before the roads were opened for traffic because of lack of visibility earlier in the morning, I toured the sequoias landmarks. Although it was still a bit cold, the sun was out and it was a spectacular day. Blue, clear skies made it hard to believe in the warnings that I was given about lack of visibility and a possible snow storm overnight. 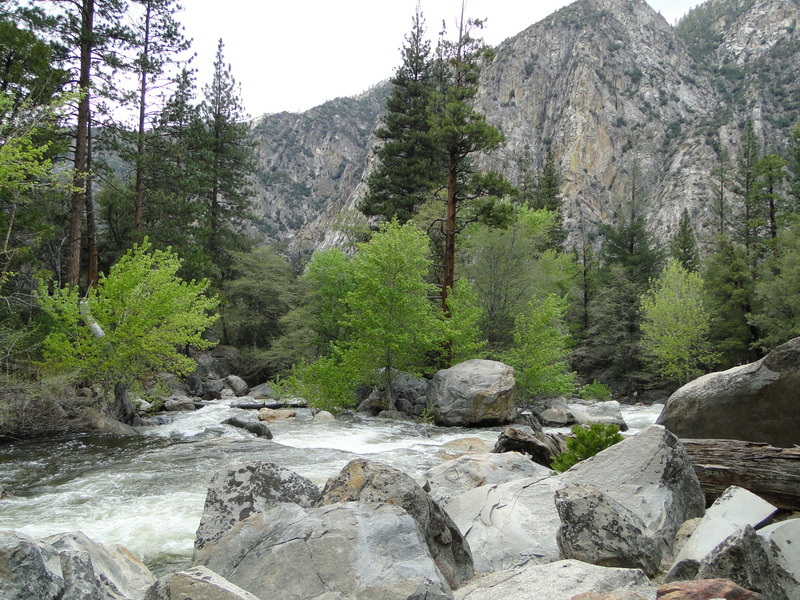 With all campgrounds still closed I stayed on the Kings Canyon Scenic Byway which for most part runs along the South Fork Kings River, stopping at the Grizzly Falls. In this section the of the road there wasn’t any traffic at all. The few visitors I had seen seemed to have stayed behind by the visitor center and places such as the General Grant Tree posing for pictures. With just a half dozen cars on the road, I could enjoy the open views, stopping at most of the viewpoints. Astonishing views! All to myself and a few bears. 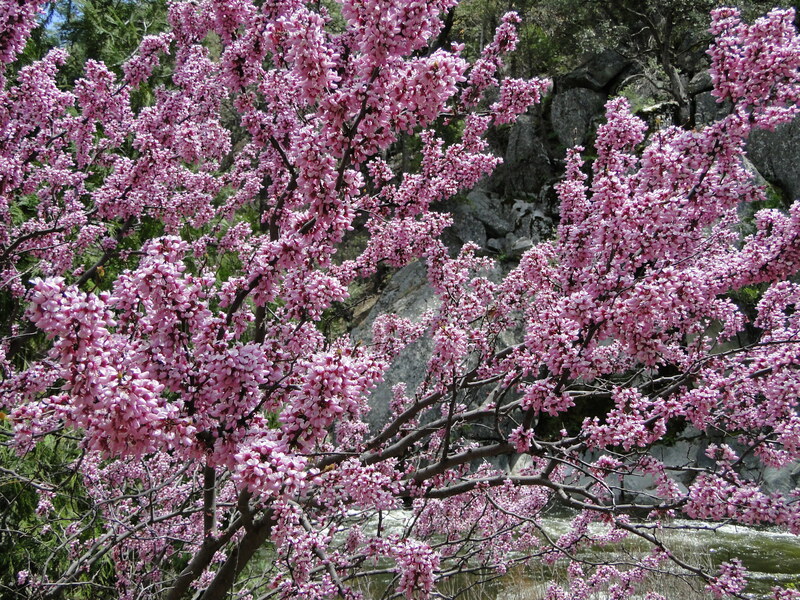 Although it felt like Winter, a few blossoming shrubs here and there was a reminder that Spring was finally arriving. 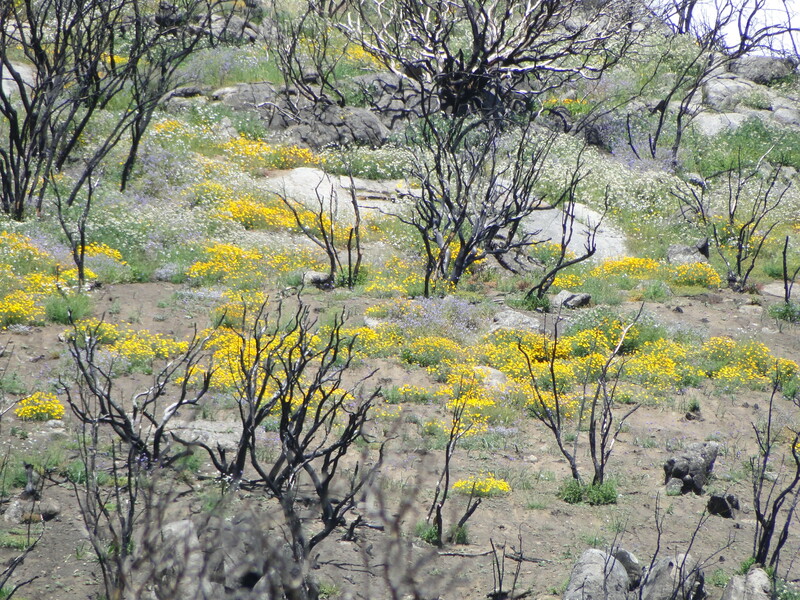 Along the road where wildfires cleared the slopes, the meadows were carpeted with yellow, orange, and purple flowers. By the time I reached the end of the road and ventured on the Copper Creek Trail, the temperature had dropped drastically. Hiking along the creek was bitterly cold. The view of the Grand Sentinel rising 8518 feet is impressive; sitting as the background image at the Zumwalt Meadow. Hiking out on the Copper Creek Trail and heading to the Roaring River Falls, I noticed that I could no longer see the summit of the Grand Sentinel which had been covered by clouds. The sun quickly withdrew and the temperature was dropping quickly. 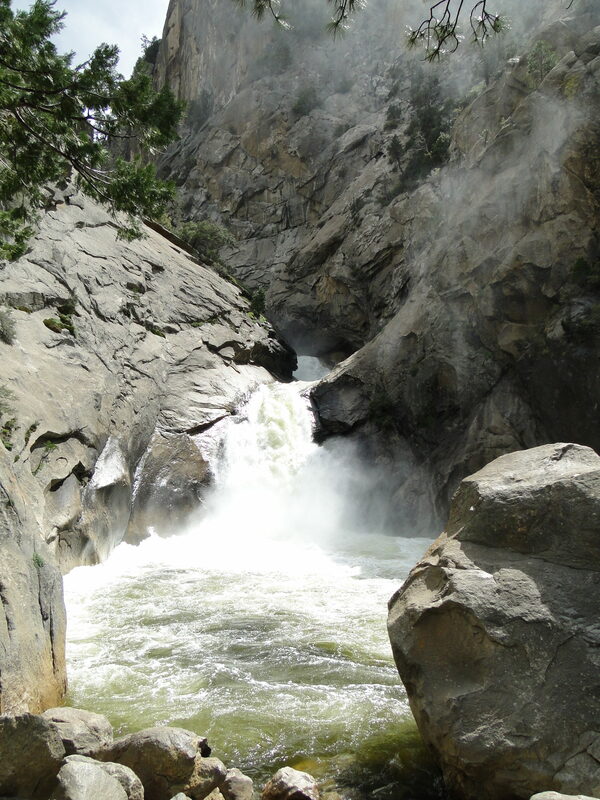 I would not pass the opportunity to hike to the Roaring River Falls, where I finally saw other people. The person who I spoke with was a local who had brought some visiting family members to the park. He told me that we should get out of there as soon as possible because within some thirty minutes there would be no visibility at all. I am glad I bumped into him because by the time I drove by the Canyon Viewpoint there was no view at sight. Driving conditions deteriorated so rapidly due to lack of visibility that I considered stopping! But, where to stop? What if this continues for the next 12 hours or so? I imagined that as I would reach lower altitudes it would get better. Somehow it did, but not exactly how I expected. Around the time I made to the Convict Flat, a campground that was closed, it wasn’t as foggy as it had been up to that point. However, sleet combined with rain and snow made it for an interesting mix to navigate the meandering road. Once again I hoped that the lower I went the better would get. Different altitudes, different weathers! I left the Sequoia National Forest thinking that things were getting better when suddenly they turned into the worst drive I had ever experienced. I only let a sigh of relief when I reached the 2000 feet mark. From there I could see the plains and although it was raining heavily, I was happy to be down from the mountains. Lesson learned! When a ranger tells you that their weather is as temperamental as a cat, trust him! 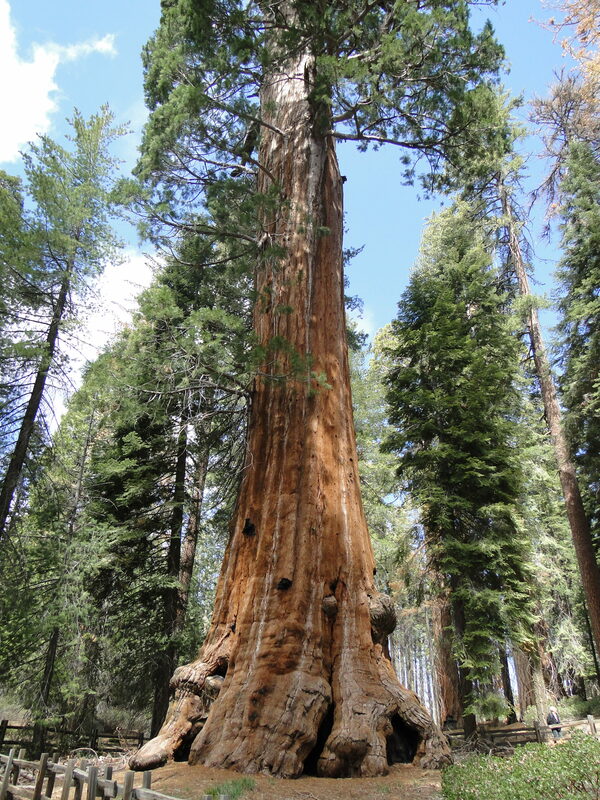 My plans and dream to spend time at Sequoia and Kings National Parks, camping and hiking for now had to be postponed. However, the experience was just as fantastic as if I had spent a week there. It was a teaser that only made me want to come back another time. A long road trip is fascinating. However, the downside is not being able to make reservations for camping because it is difficult to reach the locations on schedule. 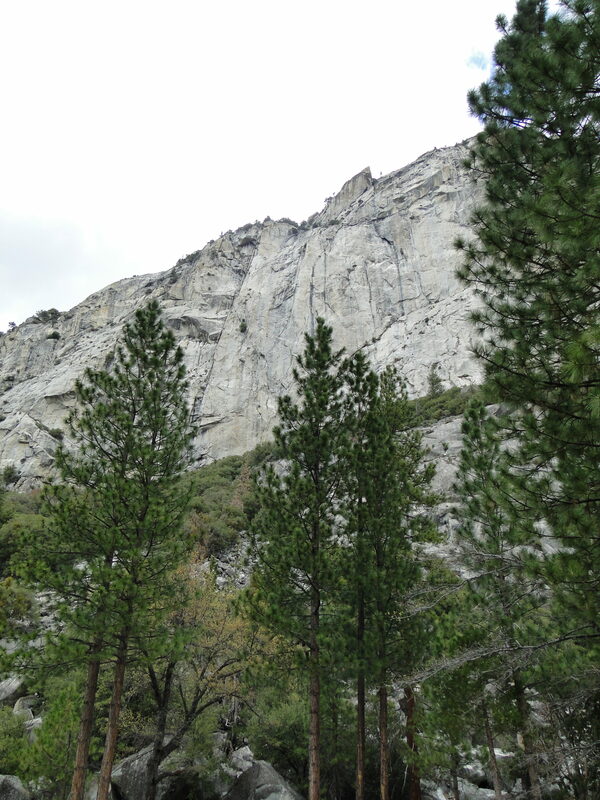 Many of the national parks I visited were stopovers. In some of the national parks that were open and operated on a first-come, first-serve basis for camping, I could spend a couple of days or so. It was getting a little more difficult as I continued north in West Coast. Although it was officially Spring, the heavy Winter was still lingering around. After all, the weather in Sierra Nevada and in the northeast mountains of California is quite unpredictable. Yosemite: One of the Greatest National Parks - Travelling With Me | The mother of all parks and home to El Capitan, the dream of daring climbers!